The Trail of Tears Map shows the distance of the routes taken from the tribal homelands of the tribes (in brown) to the Indian reservation in Oklahoma. The Trail of Tears was the name used to describe to the 1000 mile route that the Five Civilised Tribes were forced to travel, from their homelands in the Southeastern United States to reservations in Oklahoma. 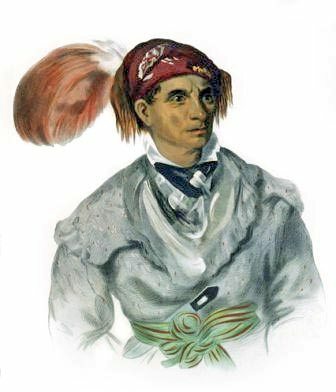 The term 'Trail of Tears' was first used by the Choctaw tribe in 1832. The Trail of Tears Map provides a bird's eye view of the location of the lands covered on their perilous journey. Trail of Tears Map - Where is the Trail of Tears? The Trail of Tears was the name the Cherokee gave to the route they were forced to travel as a result of the Indian Removal Act. 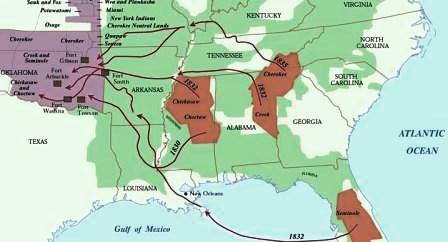 The Trail of Tears route ran from their land in the East to the reservation land west of the Mississippi - it was a 1000 mile march. Their tragic journey and route to the Indian Territory along the Trail of Tears, shown on the above map, was a desperate affair under severe conditions. Men, women, children and babies were forced to make the 1000 mile march as indicated on the Trail of Tears Map. There were few horses and many Cherokee were not prepared for the journey and the terrible cold they would experience on the route of the Trail of Tears. The above Trail of Tears Map shows the location of the lands and the route they followed and answers the question "Where is the Trail of Tears?". For additional fast information refer to the Trail of Tears Facts. Forced from their traditional homelands men, women and children were forced to walk over 1000 miles facing the most terrible trials. The tragedy of the Trail of Tears was made even worse by the hazards that the people encountered on the journey of misery, sickness, and death. The people suffered from exposure in extremely cold weather conditions, inadequate clothing, malnutrition and starvation and fatal diseases. To walk the Trail of Tears it took 6 long months. The area covered was immense as can be seen from the Trail of Tears Map. One person out of every four died on the forced march across the route which became known as the Trail of Tears.